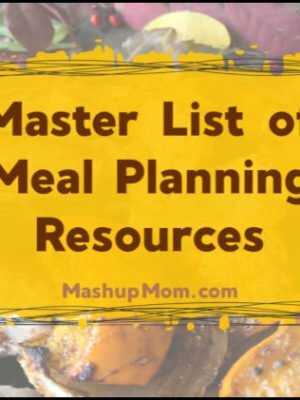 Who’s in the mood for an easy, all-in-one, kid friendly, naturally gluten free comfort food recipe today? 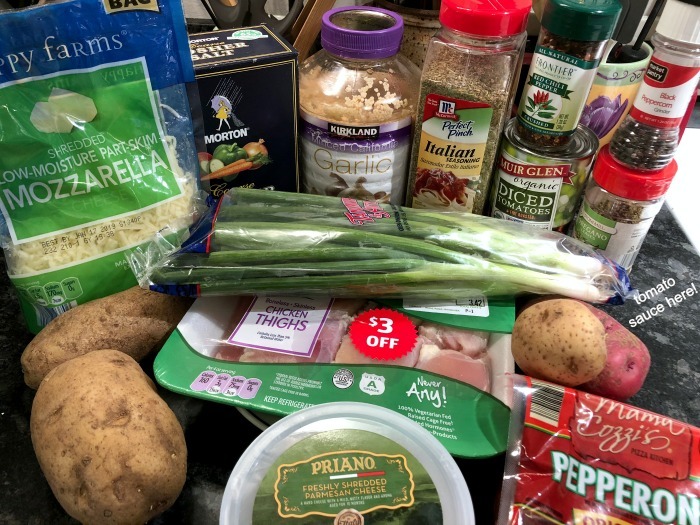 Check out this Chicken Potato Pizza Bake and see if your family loves it as much as mine does! 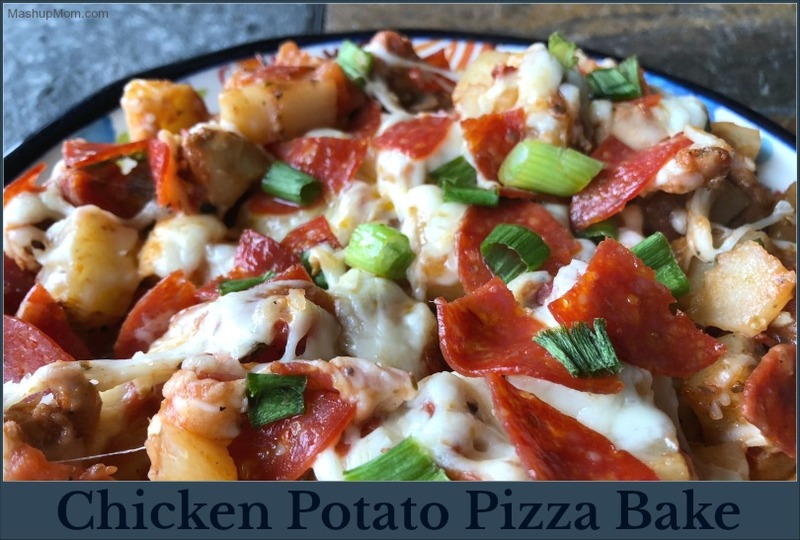 It’s a pizza… it’s potatoes… it’s… it’s… Chicken Potato Pizza Bake! I was playing around this weekend trying to use up a few old potatoes, half a bag of shredded mozzarella, and an older pack of boneless chicken thighs from the freezer — and this combination turned into such a lovely all-in-one comfort food casserole that I just had to tell you guys about it. Preheat oven to 400 degrees and spray a 9×13 baking dish with cooking spray. 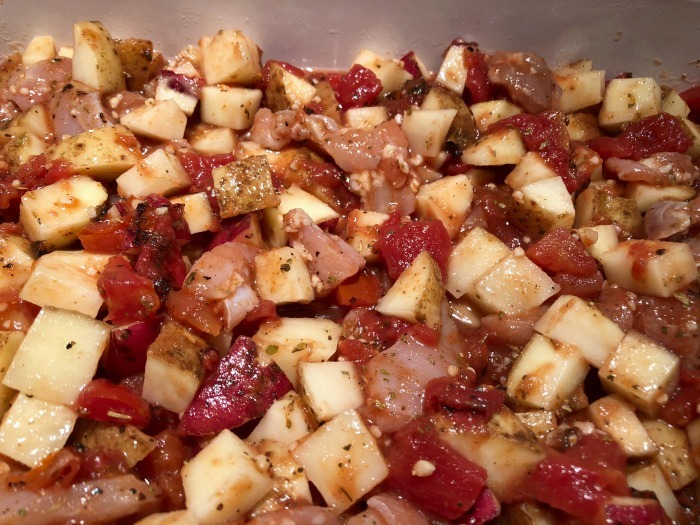 Cut up the chicken and potatoes and place them in a large bowl. Add the fire roasted tomatoes, tomato sauce, garlic, and seasonings, then stir to combine. Move the chicken and potato mixture to the prepared baking dish. Bake at 400 degrees for 45 minutes or until potatoes are fairly tender, stirring halfway through. Remove the baking dish from the oven and stir. 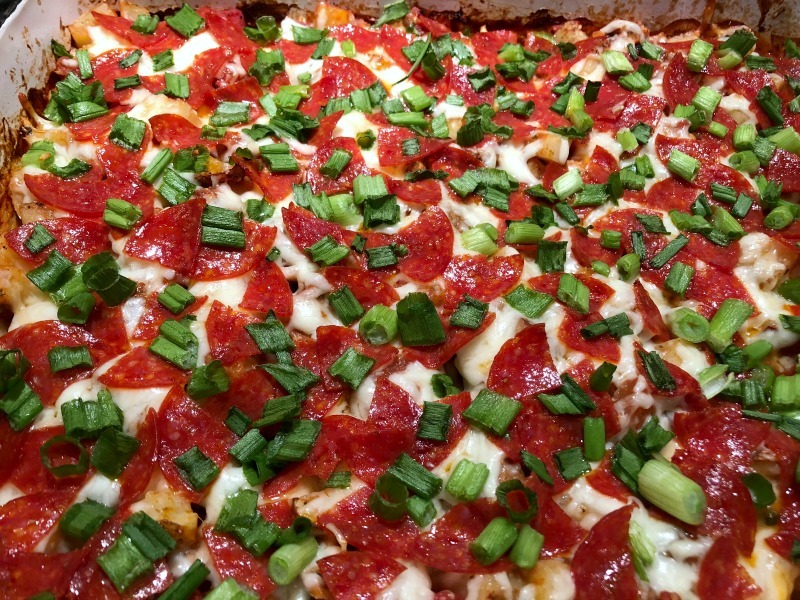 Top everything with shredded mozzarella and Parmesan, then arrange pepperoni and green onions evenly across the top. Return to the oven and bake for another seven minutes to melt the cheese nicely. Broil on high for two minutes to brown slightly, then serve. 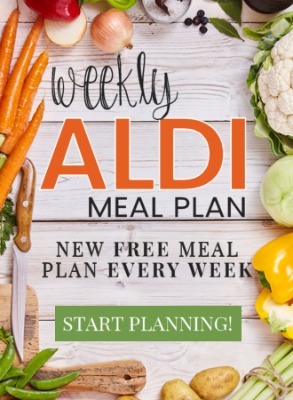 Look at that big pan of yum! 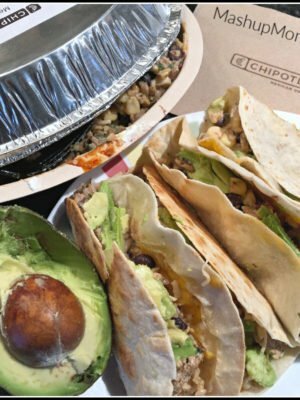 And there you have it: Unapologetic comfort food for a drizzly Fall day. 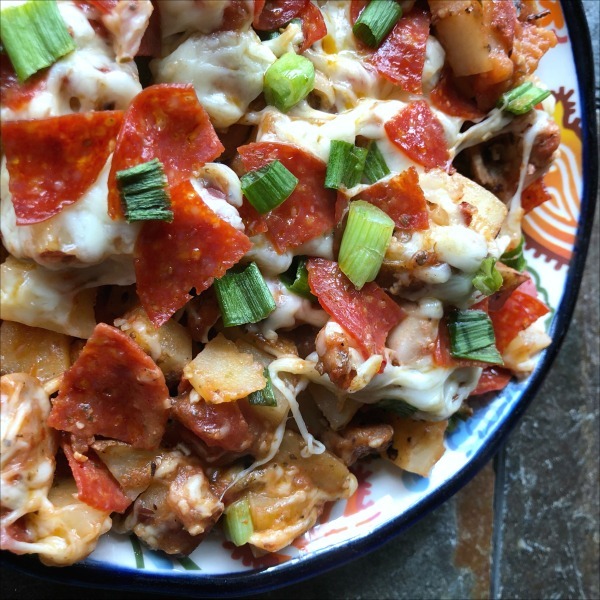 Chicken potato pizza bake is super easy to throw together, and such a nice twist on your normal pizza night. You could easily change things up by adding more or different “toppings,” too — and, this pizza casserole is naturally gluten free. 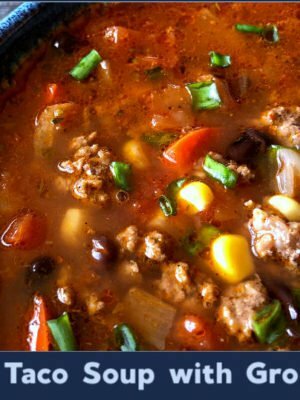 A big pan of unapologetic comfort food for a drizzly Fall day! 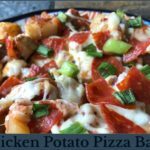 Chicken potato pizza bake is super easy to throw together, and such a nice twist on your normal pizza night. Preheat oven to 400 degrees and spray a 9x13 baking dish with cooking spray.